From this site they are available in PDF and Mobi (Kindle compatible) formats. I can also print them for you in color in A4 format with a comb binding. Printing is done on our high-quality, colour laser printer. They can also be purchased in paperback from Lulu.com. See below for URLs for each book. If you want the paperback version, please buy it from Lulu.com rather than Amazon. My royalty payment is greater from Lulu, which means I am better able to spend time writing. 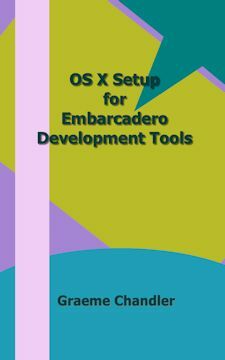 My new eBook, OS X Setup for Embarcadero Development Tools, is currently free. Download it from the Books page. Buy "Application Development with HTML5 Builder" from this site in PDF, Mobi/Kindle or A4 colour format. It is also available in paperback from Lulu.com. I built an app to control a ShopBot CNC router for Android and Apple with HTML5 Builder. Buy "FireMonkey Development for iOS and OS X with Delphi XE2" from this site in PDF, Mobi/Kindle or A4 colour format. Please read the FAQ for book licensing information. What are people saying about "Application Development with HTML5 Builder"? "Thank Jesus, Mary and Josepth...and Graeme...for "Application Development with HTML5 Builder"... Your book hits EXACTLY the 'new beginnings, follow the yellow brick road to get there' tone." "THE book on HTML5 Builder. No... seriously...THE BOOK. There aren't any others. Good thing this is a pretty good book. It's not perfect and I have found a few things missing from it, but getting it is absolutely essential. HTML5 Builder looks rather terrifying and impenetrable without it, but actually very straightforward and easy to understand once you go through the book. Especially good at covering little pitfalls and gotchas that will completely stop you cold if you don't have the book." What are people saying about "FireMonkey Development for iOS and OS X with Delphi XE2"? Coogara Consulting provides software development, consulting and mentoring as well as training for Embarcadero Delphi. If you require training, see the main site: www.coogara.com.au.